Making the Empire Cross is a series of lenticular images, which take an irreverent look at contemporary geo-political figures and events. The images form a loose narrative featuring a motley cohort of plastic toys dressed in custom made costumes, and set against illustrated comic backgrounds. They come to life playing out scenarios which are in many ways less ridiculous than the reality of the politics they parody. After the commencement of the Afghanistan war, I was not sure whether I should be more disturbed by the war itself, or the abundance of cheap war toys which seemed to flood the market at that time. My response was to collect them over a period now spanning 4 years. Gradually they formed the basis for this work, the darker side of which ponders the ways in which popular culture and media have been used to make the case for a conflict which is relatively unsupported outside fundamentally conservative communities (of all religious persuasions). Yet despite its black humor, it is my hope that the work is not heavy handed or angry. The lenticular medium also plays an important part in the visual language employed by this work. You can learn more about what lenticular images are in this section. The medium is popularly used to create engaging images for children. Here its fun, frivolous and toy-like nature, and a comics aesthetic, is subverted to reveal how even the most unlikely stories can make their way into popular culture and into the realm of ‘truth’, principally through media associated with entertainment. The artworks are large scale lenticulars, which animate as a viewer walks by – the largest being 75 cm x 75 cm. These are much larger than the ones you may be accustomed to, but if you want a small lenticular from the series, you can buy one from the site as I have had a limited number of small ones made. They vary in size but the largest is 10 x 10 cm. Feel free to contact me if you have questions about the work – info@priscillabracks.com. Any sense that Bracks may have transgressed the bounds of common decency with her cartoon commentary on the appalling debacle in Iraq evaporates on viewing this artefact. Commercial entertainment has assimilated the war (and the public misinformation surrounding it) to the extent that the parodies produced by Bracks for Making the Empire Cross virtually enter the debate on its own terms. Far from trivialising the subject, Bracks’ work reflects how bad things really are. The ludicrous ignorance and shortsightedness that led to the invasion of Iraq is almost inescapably comical, and nothing could underestimate the scale of the catastrophe more thoroughly than Bush’s untimely Hollywood-style attempt to resemble a victorious war hero. Making the Empire Cross is a logical development of the way we are encouraged to view the war, as a simple exercise in proving that might is right, and the West knows best (tellingly, Bracks’ narrative, like the official version of events, makes little mention of oil). The philosophical justification underlying the invasion of Iraq is the assumption is that the world consists entirely of Americans and people who want to be Americans. This view is embodied in popular culture, and Australia conforms to it quite comfortably. The turmoil in Iraq has resulted from the complete failure of the U.S and its coalition of the willing to understand how things work in other societies. Our arrogance is a symptom of military and economic supremacy. We don’t need to understand them. Their role is to understand us. It was therefore believed by the invading forces that once the political and physical infrastructure of Iraq were destroyed the grateful inhabitants would automatically adopt foreign institutions, as if following a script dictated by the laws of nature. Not much thought was given to the possibility that the locals might resent seeing their country occupied by heavily armed foreigners. As it turns out, the coalition of the willing is not as welcome as American GIs bearing gifts of chewing gum and nylon stockings always seem to be when they liberate Europe in movies about World War Two. The West’s bizarrely deluded assessment of Iraq was based on a view of the world that translates everything into Western terms. Following this example, Bracks has translated the story into terms of Western pop culture. The leading roles are played by plastic action hero dolls and the ubiquitous Barbie. In Episode 1 GI Joe kapows Jihad Joe, but then things start to look grim for the rock-jawed, pectoral-packed team leader of the master race. By Episode 2 the situation has degenerated into chaos and ‘it becomes clear on the ground that the only winners in this war are the armies of extreme adventure tour guides providing hard-core thrill seekers with the war zone adventure of a lifetime’. In her capacity as one of these tour guides, super-model Baghdad Barbie thus achieves an entrepreneurial coup in the cradle of civilization. Bracks mixes a disorienting cocktail of visual, economic and sociological references to evoke the madness currently raging in Iraq. Fantasies from Walt Disney, Roger Vadim, Roy Lichtenstein, pulp magazines and Las Vegas are morphed with the realities of mass-destruction and Haliburtonian war profiteering. As a medium and a technique, the lenticular process used by Bracks for this project is eerily appropriate to the subject matter, which is not just the war, but also the mass media. Lenticular prints resemble the pixelated pictures on an old style television set. Laminating two pictures together allows a transformation to occurs when the image is viewed from different angles, which underlines the fact that the real picture is not a simple one. The series of images illustrating Bracks’ Making the Empire Cross is one component of a more comprehensive work that exists as a website1 with pages devoted to downloads, news, behind the scenes and gossip. The gradual metamorphosis of public information services into a version of Entertainment Tonight is accomplished completely and abruptly on her site, giving a clear picture of where our news media is headed. We like our news to be palatable. This doesn’t mean it has to be good news (although the manipulation facts in official war reporting has always tried to create as much good news as possible). To be commercially successful, the broadcasting of information is becoming increasingly simplified into attractively presented, tasty sound-bites. We have become accustomed to the announcers on news and current affairs programmes being more like a cast of likeable characters than reporters. There is widespread uneasiness about this trend, and the Iraq war reveals why it is dangerous. Waging war for the cameras requires a plot than can be easily followed, and it was simplistic good guy vs bad guy thinking that helped to create the problem in the first place, when Bush informed the world in November 2001 that ‘You're either with us or against us in the fight against terror’. Making the Empire Cross garishly illustrates the hopeless inadequacy of super hero vs arch villain as a tactical analogy for any major conflict, especially one between radically different cultures. As the consequences of believing in this folly play out in real time, Bracks presents her own version of events in episodes like a serialised adventure comic. Episode 2 offers the disturbing prospect of a world in which nobody can tell the difference. There is little doubt that news and current affairs broadcasters claiming to bring us the truth, are aware that the trouble with truth is: it is open to interpretation and manipulation. While audiences are increasingly more sophisticated, I continue to be surprised (and use myself as a text book case study) at just how gullible they are. I know from the most basic of history lessons for example, that propaganda is rife in times of war: that it is designed to make us feel heroic military efforts are going well, and that the job is almost done. Movies depicting brave feats in the face of an often-faceless dehumanised enemy, complement news and current affairs broadcasts, in a complete propaganda package. Of course I am being simplistic here, and for all my gullibility I find little to be positive about where the progress in Iraq, for instance, is concerned. Truth must be somewhere …. Years ago media theorists noted that television (and media generally) comprised something of a continuum where the boundaries between news, soap, sitcom and drama blur. Ask Princess Diana and family. The characters in daily news impinge upon our lives in a way that tends to render them as soap stars and ultimately like comic book characters. To begin with, the conflict between good and evil forms the foundation of many a good story. Unfortunate terms like the “Coalition of the Willing” sound as if they have been lifted straight from the pages of a cheap comic (the more sophisticated version would show greater imagination), and the characters involved in this group are represented as the light in a dark world. Just when we think that John Howard, Tony Bair and George Bush have lost ground, another attack by the evil opposition strengthens their positions. Looking at global politics in this way it is almost a struggle not to have some, albeit limited, admiration for the ultimate escape artist Osama Bin Laden, the wicked dictator Saddam Hussein, or a host of lesser characters that provide seemingly endless diversion. Meanwhile, the rantings and ravings of the Coalition of the Willing ensure that it is difficult to take serious issues, seriously. So while I am well aware of which team to barrack for, I am also aware that “it’s only a movie” or in this case, like a movie. Priscilla Bracks’ Making the Empire Cross abounds with comic book convention in an attempt to reveal the “truth” behind news and how this connects with entertainment. Using lenticular photography, lush, glossy and colourful, Bracks exploits our fascination with the faux third dimension and perhaps childhood memories of playing with lenticular rulers and kitsch religious post cards. She then presents her work on a simulated movie website with all the trappings including the making of, characters, a narrative, behind the scenes, stars and gossip. Based on current news footage the characters are recognisable and audiences are instantly familiar with both them and their story, be it truth or fiction. If political points can be scored with humour then Bracks is on the money. In a work that relies heavily on a background narrative her story is witty, (somewhat) amusing and insightful on many levels. Making the Empire Cross. Episode 1:Unleashed, begins with that Crucifixion and brings us up to date on its ongoing consequences. Bracks’ black humour elegantly brings together religious mythologies, politics, documentary, literature and entertainment. With “A long, long time ago, in a land far, far away...” she sets the scene for an unfamiliar view of a familiar story in a language that exploits the patronising tone of “infotainement”. So familiar is her territory, and this is the point, that even where the names have been changed no one is actually protected. On the contrary, this work is accusatory and the artist is not afraid to point the finger. One feels, however, that faithful to documentary style Bracks is attempting to generate a distance from the issues she is dealing with. Whilst she clearly has a view and her audience is well aware of this, part of her satire can be found in this scarcely disguised distancing from the issues she is dealing with. In other words her story attempts, and needs to fail at fair reportage as she implicates all of the characters, “good” and “evil”, without fear or favour. David Broker is a writer, curator and Director of Canberra Contemporary Art Space. Priscilla Bracks is a visual artist practising in photography, digital illustration, and installation. Her practice explores the human condition and world we inhabit. She is especially interested in chaos, change, the patterns chaos creates, and the way these factors impact upon personal, social and national identities. Priscilla is also a qualified solicitor, and has performed roles across art administration, advocacy, policy development and creative direction. Her work in these fields is informed by her practice, and motivated by the need to create more opportunities for artists to develop sustainable careers. She graduated from her Law degree in 1993, and from the Queensland College of Art with first class honours in 2002. See more work by Priscilla Bracks at http://www.priscillabracks.com For more details about Priscilla's career as an artist please refer to her Artist CV, in .pdf format. Saddam appears courtesy of Glen Marshall, with very special thanks to Parry Exon for finding him in Hong Kong. Special thanks to Gavin Sade, Sharon Green, Victor Rijken, Robb Kelly, Jay Younger, Phil Thompson, Kayell, Adam Macalister, and Nigel Oram. A lenticular image allows the viewer to see different images on a single picture surface, when it is viewed from different angles. Whilst the name lenticular image may be unfamiliar, most people will have seen lenticular images before. For example, they are commonly used to create moving images on tazos or collector cards, and distributed as gimmicks in packets of potato crisps. 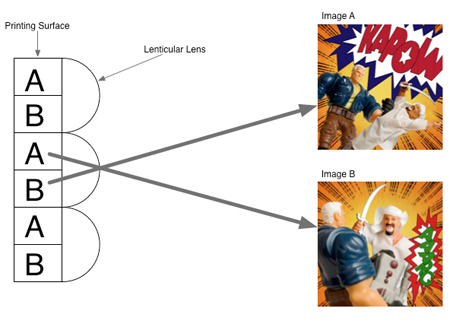 This changing image effect can be used to create an illusion of movement (see for example Meanwhile, Back at the Ranch), or it can be used to change the image between two entirely different images (eg GI Joe v Jihad Joe). A lenticular image has two components: a printed image created by interlacing a number of different image frames together; and a lenticular lens screen through which the image is viewed. The first step in making a lenticular image is to produce each frame of the image. A lenticular image can contain many frames (some say up to 70). The images in Making the Empire Cross – Unleashed! have two frames each. The frames were created using Adobe Photoshop. A specialised software program was then used to interlace the two frames together. This means that the two frames (Image A and Image B) were divided into hundreds of thin strips and recombined in the manner shown in Figure 1. For this series a print of the interlaced image was then made using archival pigment inks. This print does not look at all like either of the two component images, although fragments of the images do make them recognizable. The images become visible once a lenticular lens has been carefully aligned over the interlaced image. Once the lens is in place, the viewer can only see one frame at a time. This is because the ribbed lenticular lens has a series of parallel lenses (lenticules) on its surface that magnify portions of the segmented (interlaced) image underneath. The wikipedia also has a good description of lenticular images and http://www.lenstar.org also provides information on creating lenticular images. Coverage and reviews of Making the Empire Cross. Episode 1: Unleashed!. Machine Magazine Edition 4. Review of Making the Empire Cross by Nicholas Thompson. Featured Artist Interview in weAREtheIMAGEmakers : Issue 3.0 by James Quinn-Hawtin and Brad Eastman.